As always, let us know about any that didn’t make the list. After all, it’s not only our anonymous compiler doing the work; the list gets even better with your contributions. Kansas, Ohio, Wisconsin, Illinois, Pennsylvania, New York, Indiana, Michigan, and Minnesota all appear in this month’s edition. Aug. 1, Friday – Knox Amish Schools Benefit Auction, 4 pm. At the Bill Miller Building, 2879 Nineveh Road, Knox, PA 16232, Clarion County. Aug. 1, Friday – Hay Day, 1 pm, Yesteryear demonstration of hay making on the farm, dengeling/Dengleschtock (sharpen scythe). 735 Spruce Road, New Holland, PA.
Aug. 1-2, Fri. & Sat. – Ohio Mennonite Relief Sale and Auction. A benefit auction held annually on the first Saturday of August. Buckeye Event Center, Dalton, Ohio. 330-473-2253 Fri. 4-9 pm, Sat. 7-3. Aug. 1-2, Fri. eve. & Sat. – 37th Annual Amish Benefit Auction, 99 Muskrat Springs Rd., Mifflintown, PA, in Juniata County. Aug. 2, Saturday – annual Shirktown Threshing Day, Big Spring Farm, 735 Spruce Road, New Holland, PA, 9-4. by Swiss Pioneer Preservation Association. Aug. 2, 2014, Saturday – 19th Annual Pineview School Benefit Auction, Danville Auction Barn, 15780 Body Rd., Danville, OH 43014. Proceeds benefit 5 local schools. Aug. 2, Saturday – Annual Amish Benefit for Hospital Aid, or Annual Benefit Auction for Amish Hospital Aid, 9 AM, at the Shetler Farm, 6482 Hildom Road, Conneaut, Ohio. Benefit sale is usually held the first Saturday of August. Aug. 13-16, Wed.-Sat. – Rough and Tumble, 66th Annual Threshermen’s Reunion featuring steam and gas engines. Kinzers, PA.
Aug. 15-16, Fri. eve. & Sat. – 5th Annual Central PA Relief Auction, Ickesburg Fire Company Grounds – Perry County, 10350 Raccoon Valley Rd., Ickesburg PA 17037. Proceeds benefit: USA disasters, War victims in Syria, Christian Literature, Haiti Aid. Aug. 16, Saturday – Medford Fall Amish Quilt and Consignment Auction, Medford, Wisconsin, 8:30 am, W8332 Pine Ave., Medford, Wi . From Medford, 7 Miles west of Medford on CTH O to Oak drive, 2 miles south on Oak dr. to Pine Ave.
Aug. 16, Sat. – Troyer Relocating Auction, 348 Weeks Rd., Panama, NY, public auction, lunch stand by Amish Clover Hill School. Aug. 22 & 23, Fri and Sat – Arthur Mennonite Relief Sale, Otto Center, Arthur, IL. Sponsored by the Mennonite Central Committee. Aug. 23, Saturday – Sheldon Amish School Consignment Auction (fall), 8:30 a.m., twice yearly, N1009 Marshall Road, Sheldon, WI. Location from Ladysmith: South on HWY 27 go 9 miles to Broken Arrow Rd., east on Broken Arrow 6 miles to Marshall Road, South 1/2 mile on Marshall. 715-452-5389. Aug. 23, Saturday – Yoder Heritage Day, 6 am Pancake & Sausage, 8 am Horse Plowing demonstration, Yoder, Kansas. Morning through early afternoon. Yoder Heritage Day is held yearly on the fourth Saturday in August. 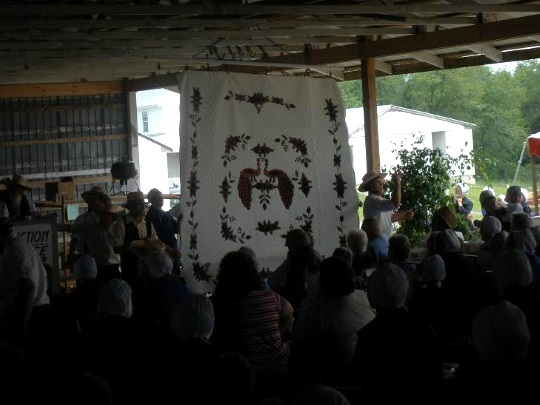 Aug. 29-30, Friday & Saturday – Fall Amish Quilt Auction, Crafts, and Flea Market, Yoder’s Farm, 10885 N. Leaton Rd., Clare, MI. Labor Day weekend. Aug. 30, 2014 (Labor Day Weekend): The 17th Annual Amish School Benefit Cookout. Miller’s Bakery and Furniture, West Union, Ohio. The menu includes hamburgers, hot dogs, chips, fresh pie, homemade ice cream, coffee and soft drinks. Aug. 30, Saturday – 9:30 am, Fall Amish school/consignment auction, 22671 County Hwy 10, Fergus Falls, MN 56537. This auction is held semi-annually in both the Spring and Fall with proceeds used for the Amish Schools. West of Wadena, MN, new auction site. Aug. 30, Saturday – Bonduel Consignment Auction, Bonduel, Wisconsin. The Bonduel Auction is always the Saturday of Mothers’ Day weekend and the Saturday of Labor Day weekend each year. Aug. 30, Saturday – 56th Semi-Annual Milroy Amish School Consignment Auction, at the Milroy Amish School, 2101 W. 900 S., Milroy, IN 46156. (or 2010 W. 900 South?) At the corner of 900 & State Road 3 – just west of State Road 3, two miles south of the flashing lights of the intersection of State Roads 3 and 244. Usually held around Labor Day. …of things to do, Amish/Mennonite-wise. My thought exactly on the quilt Alice Mary. I think you’re apt to find lower prices in these more off the beaten path places. Thank you Erik, for having New York State in this time. I really appreciate it. I was wondering if there are any auctions later in the year like October or late November. At least in PA, you will find auctions every weekend in October. They are the fall mud sales without as much mud! that one of this was going to be in Seymour, Mo AND that it was going to be this coming week … as we are going to be in that area then. Alas, it was not to be. Oh well, doesn’t stop me from hoping that everyone enjoys these August auctions wherever they might be. OldKat, you may be interested in the weekly produce auction in Seymour, Missouri, called the Highway 60 Produce Auction. An article from 2012 says they have a bake sale on the 2nd and 4th weekends of the month. Thank you so much for the lead. That is very kind of you. The nicest people really do frequent Amish America! You’re welcome. Just be careful about waving to your friends; the auctioneer might think you are making a bid! And hat tip to Linda for both the info and good advice on preventing accidental bidding! Can you believe it, it is August 2 already. Where has this summer gone? Enjoy the auctions and be safe everyone. Byler Auction, 8905 Grove Rd., Guys Mills, PA, due to relocating. Saturday, August 23, 2014 at 9:00 a.m.
Furniture Shop Dispersal, Shop Tools, Buggies, Household. BBQ Chicken, Bake Sale, Home made ice cream. Aug. 16, Sat. – Smicksburg Benefit Auction, 9 am, at the Miller farm, Smicksburg, PA. 1-1/2 miles east of Smicksburg, 1/2 mile west of the cheese house on Route 954. Furniture at 10:30 a.m., Quilts approx. 1:00 p.m. Annual Fennimore Produce Labor Day Auction. 14800 County Rd T, Fennimore, Wisconsin. Featuring handmade Amish quilts, furniture, in season produce and flowers. Here are three links, one for the upcoming Yoder’s Quilt Auction in Michigan, and two for the past Fredericktown Benefit Auction in Ohio. 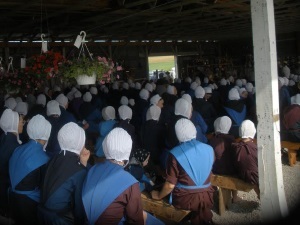 “15th Annual Amish benefit auction a success,” is an article with 2 photos from Ohio. Also known as Yoder Days, here is a link to 135 photos from Yoder, Kansas.